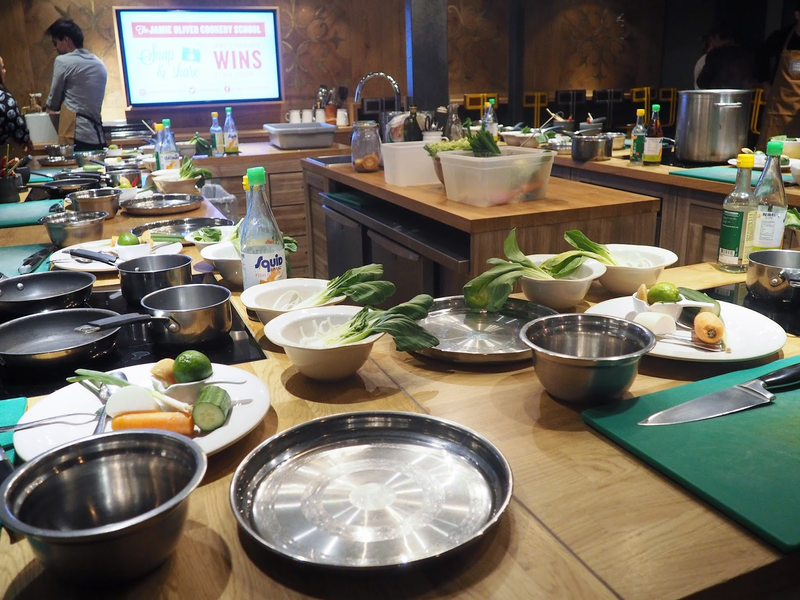 It's not every day you get invited to attend a cooking class, especially when it's at Jamie Oliver's brand new Cookery School. I've always wanted to attend a class of similar nature; I am getting married in April and despite not being the biggest cook, wouldn't hurt for me and the future hubby to pick a few skills. 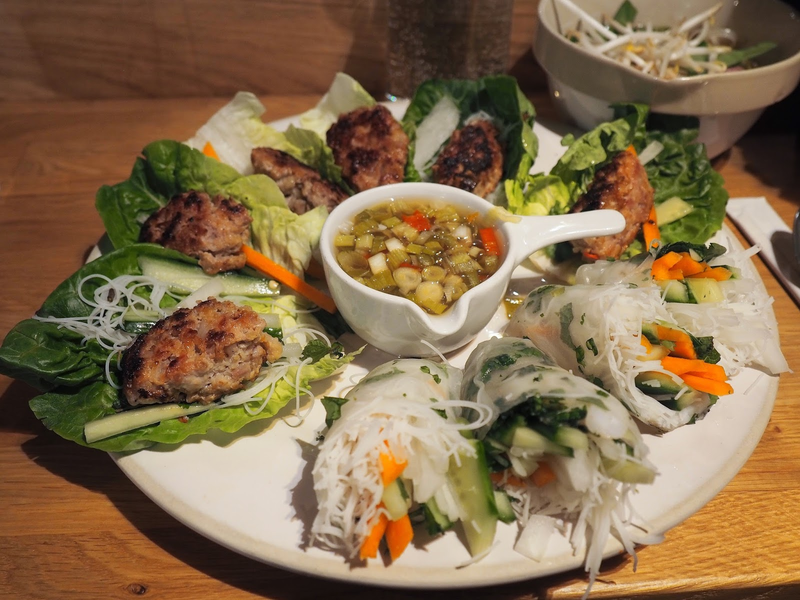 Jamie Oliver is a household name and we simply had to try the latest of his growing enterprise which is why, when I saw the invitation pop into my inbox I immediately accepted and off we went for a night of Vietnamese street food preparing. 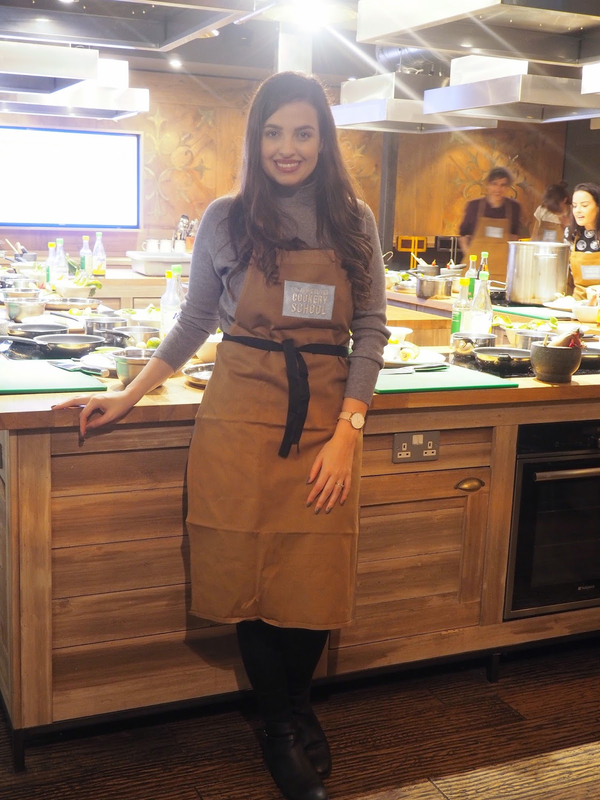 The cookery school is situated at the back of the Shepherd's Bush restaurant in Westfield and as soon as you walk in everything looks cool and well put together. The kitchen areas are adequately large and I knew there would be enough space for all of us in attendance to cook comfortably. Upon arrival, we were offered complimentary drinks, as well as instructions on how to get ready for the class. We put on our aprons and, Philipe and I were ready for some cooking! The class was split into a couple of sections, to ensure everything was easy to understand and follow. Before cooking the dishes ourselves, our Chef Thom talked us through each step, adding a bit of comedy here and there, as well as quizzing us on ingredients we were to use. 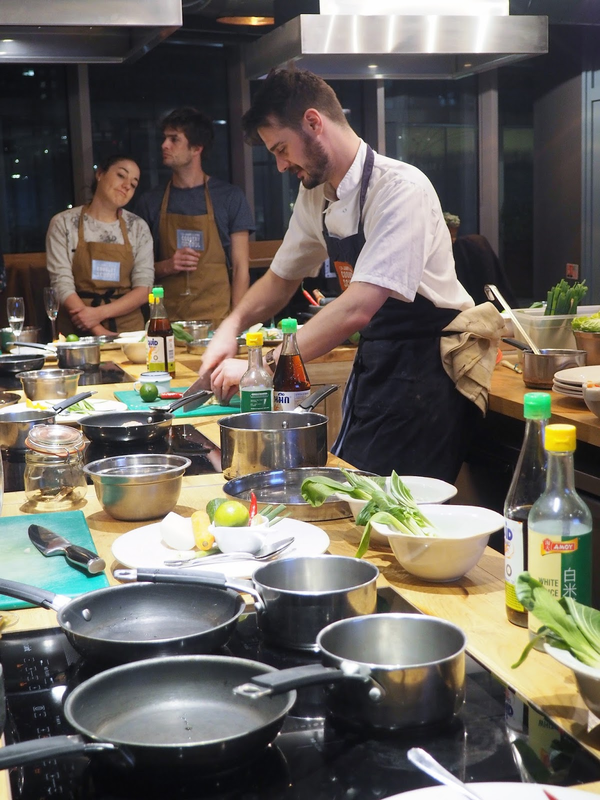 Thom was very approachable and funny; he had such an extensive knowledge of the ingredients and his passion for cooking really showed through when teaching our class, which made it even better especially for us beginners. 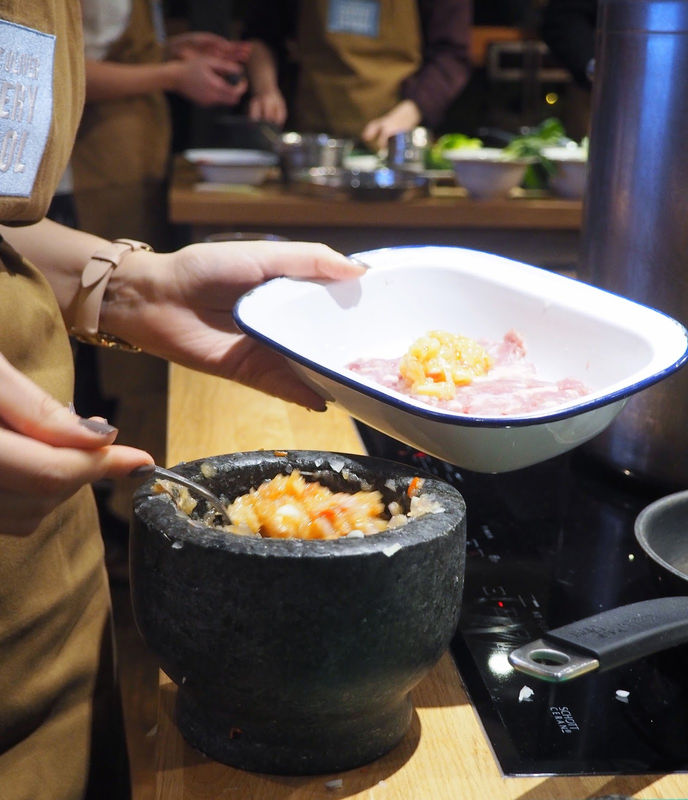 Everyone was also welcomed to taste and smell some of the ingredients, making the class much more enjoyable and learnable. On the menu for this class, we had pork balls with nuoc cham dipping sauce, a beef pho with homemade beef stock and fresh prawn summer rolls. For a two hour class, I was really amazed at the amount of dishes we learnt about and also got to cook, and most importantly taste! When it came to us getting our hands dirty, all of the equipment and ingredients were neatly laid out for us, definitely making things a lot simpler. Neither of us is very good in the kitchen, but the instructions were so simple to follow that we can definitely see ourselves replicating the recipes at home, especially the dipping sauce which we couldn't get enough of! To make that easier, after the class we were all sent a follow-up email with the recipes which was very thoughtful as I couldn't possibly remember it all. Overall, we thoroughly enjoyed the class! We did fight a little as to who would be doing the cutting and cooking but I must say, I was impressed by how well we worked together and how great our Friday night turned out to be. Philipe wasn't too sure he wanted to go in the first place but now, he would love to attend another one as well as send my parents to try one; sounds like a great Xmas present for them, don't you think?! There are so many different classes starting from as little as £35, I am sure we will have no problem finding one we/they will simply love! If you like the sound of this, check out their website or follow them on Twitter and Facebook to keep up to date with all their latest news. If you do go, I'd love to hear how it went! How was your weekend? Try anything cool and different like we did? Let me know below! Thanks for reading beauties and happy Monday! *Sponsored post. All opinions are my own (disclaimer here). That really sounds like you had a great time. I don't really cook, but I would make an exception for this opportunity. Those dishes look amazing. Well done. 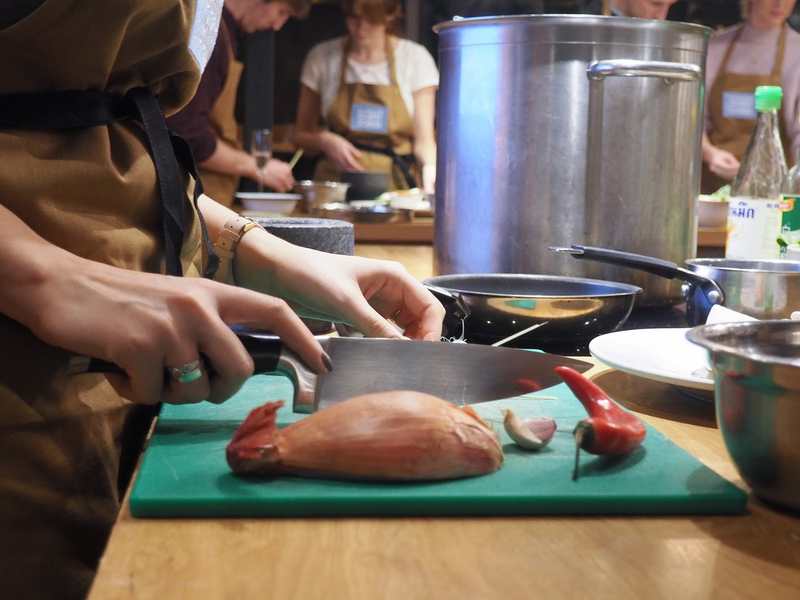 A cooking class would be a great experience. Até já fiquei com fome. Mas confesso que gosto muito mais de comer do que cozinhar! Que delicia amei tudo, obrigado pela visita, tenha uma semana abençoada. OMG this looks like soooo much fun! I loveee Vietnamese food and wish I had more time to make anything like this at home! Btw you look soo cute in these photos! This sounds like such a fun evening and something great for you to do together! This is fabulous! Best experience ever! Wish I could be there! That's sounds amazing, dear Pam! 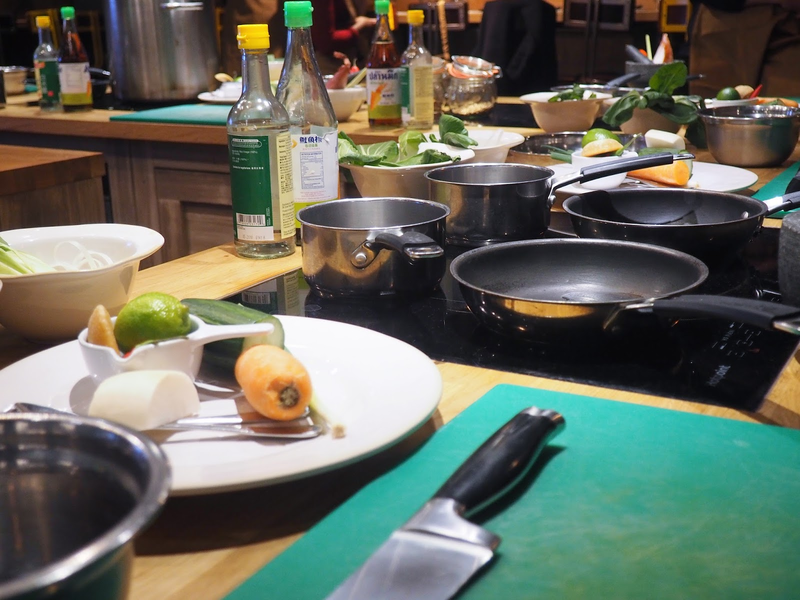 This Cookery class is perfect, nice price to give as a present as well and how nice they were, sending emails with the recipe after it! 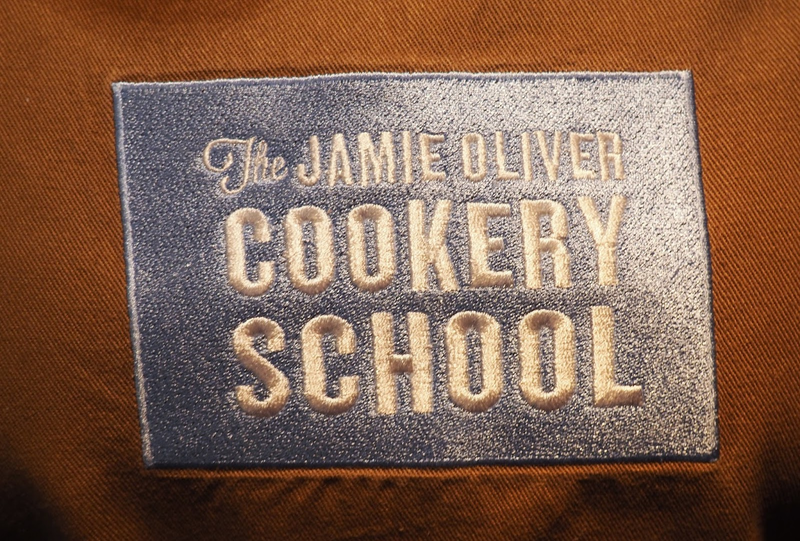 Jamie Oliver cookery school sounds really great, I like his attitude about feeding kids and the world in a healthier way. You look so sweet and beautiful with the apron! I hope you have a beautiful week! Oh my, what fun! This would have been amazing, I'm so jealous. We have a Jamie Oliver restaurant in the city and I've been twice (to eat not cook) and it's delicious! 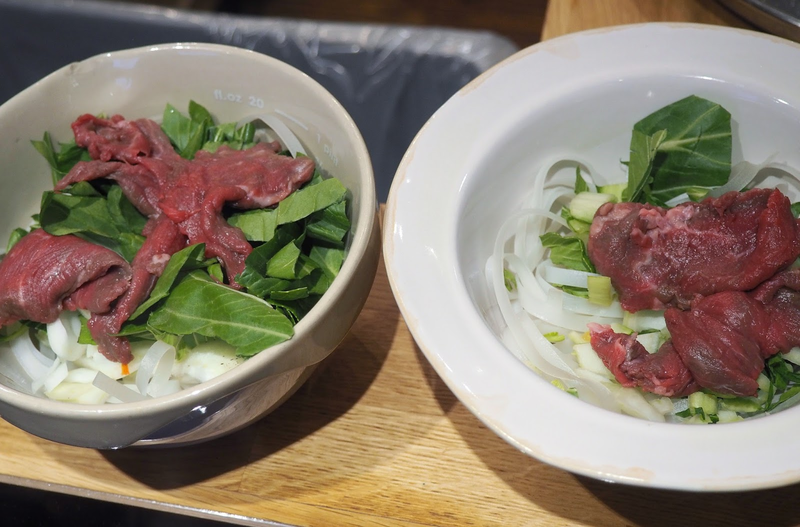 Oh man I would love to learn how to make pho! It's one of my favourite foods ever! Oh wow. Such an amazing day! I bet the food was out of this world!